Painted Hills Natural Beef got its start in 1997 when seven ranchers in the Wheeler County area of Oregon got together to form a new cattle venture that would protect their top quality animals from being blended with cattle of lower quality. The company is now a wholesaler of boxed primal cuts of steaks, and just recently added deli meats and jerky to their line up. The cattle they raise receive a 100% vegetarian diet throughout their lives, grazing the pastures of 80 family farms. The animals never receive added hormones or antibiotics. The resulting jerky is 100% gluten free and made with no MSG or preservatives. This Sizzling Sriracha variety comes with no additional description or claims other than, "Gluten Free" and "No MSG", however the company claims to make their own in-house sriracha sauce. Grass-fed beef, brown sugar, tomato paste, gluten free soy sauce, vinegar, red chilies, salt, natural flavoring, garlic powder, lime juice. The first flavors I identify is a light red chile pepper, followed by a faint sweet and light salt. The chewing brings on a bit more red chile pepper, along with a light natural meat flavor. There's a light garlic that comes in late along with a touch of tomato. As for being marketed as, "Sizzling Sriracha" it doesn't really hold up well. For one, it's not "sizzling". There's only a moderate level heat at best, registering a "medium" on our heat scale (level 3 out of 5). Moreover, the sriracha doesn't really show up as the classic Thai chile sauce condiment that we all know and love. Rather, it's more of a standard, red chile pepper flake flavor with a light garlic, but doesn't really blend together as sriracha. Otherwise, the primary taste profile is a light red chile pepper, a light garlic, and faint touches of sweet and salt. There's a noticeable marbleized natural meat flavor that comes through. These are thick slices of meat, yet easy to bite off chunks, and feeling slightly moist. I don't see much fat on these slices, but I do taste the fatty flavor in this. They take on a very meaty feel, and once chewed down soft, take on a light steak-like texture. 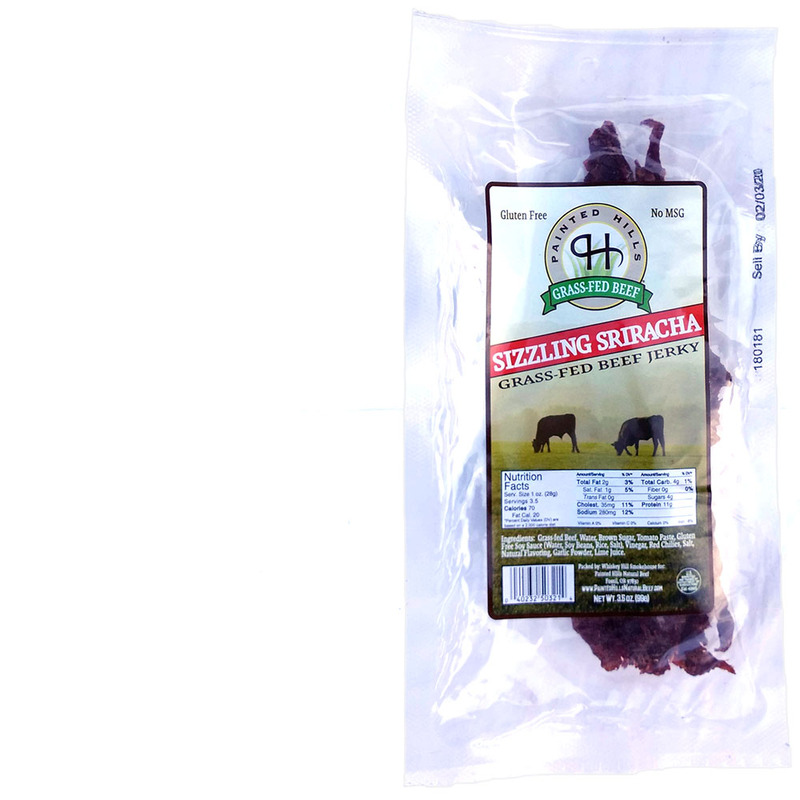 This Sizzling Sriracha beef jerky from Painted Hills Natural Beef serves up a noticeable red chile pepper flavor with swashes of garlic, and touches of sweet and salt. It's not the classic "rooster" branded Sriracha sauce that we all know and love, but rather an in-house recipe that remains light enough to let the natural flavor of Painted Hills' grass-fed beef come through. You get a lightly fatty, marbleized beef flavor that remains easy to chew but meaty and nearly steak-like in texture. Despite the sizzling flavor name, it's not really that hot at all, just moderately spicy at best. Otherwise, it's a toned-down Sriracha flavor designed to keep the focus on natural, grass-fed beef.